Thank you for sharing the way Boxers and Saints go together. I love fining out that there was some purposeful design to the cover or to the spines of the book, such as Hogwarts coming together if you put together the spines of a certain printing of the Harry Potter series. It's especially cool because they are two different sides of the same story - and two different sides of the two different faces. The same but different. 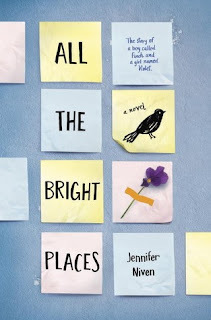 I abandoned All the Bright Places by Jennifer Niven because it was too intense and emotionally exhausting for me. On top of this, having a bipolar friend and a bipolar family member, means reading differently. When I discovered that there would be a suicide, I couldn't read more. Wow! These books sound amazing and will have to read them this summer. I loved Boxers & Saints. 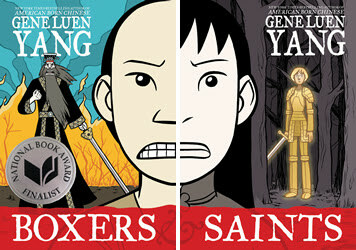 I am a fan of Gene Luen Yang. He's the one who won me over to graphic novels. I read Textbook AKR recently and had many moments like yours. She will be missed. I think my students were surprised at how much "meat" there was in American Born Chinese; we had some incredible discussions! I read All the Bright Places two years back, I think, and remembered feeling how raw this is. By and large, I enjoyed it, but I do get the romanticized part that you refer to here. Thanks for sharing, Myra. I have a student this year who Finch reminded me of, but I wonder what message a child who identifies with that character would get after reading that book.